WASHINGTON -- It may seem like last month's shootings at a Newtown, Conn. elementary school were the last straw for those demanding action to stem gun violence. 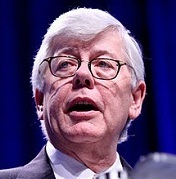 But really, today's gun debate is nothing new and there won't be any real changes made to gun laws, National Rifle Association President David Keene predicted Thursday. During a Christian Science Monitor breakfast with reporters, Keene said the NRA, one of the most powerful lobbying groups in D.C., hasn't changed any of its positions on what may or may not be acceptable in terms of gun reforms. In fact, he said, there's only one thing that's really changed in response to the spate of mass shootings in recent years and, most recently, the Newtown massacre that left 20 children dead. "I think that our opponents' hope [has changed]," Keene said. "They hope that they can use emotion to achieve an anti-firearms agenda that they haven't been able to achieve in the past. But my suspicion ... [is that] people are smarter than politicians and that common sense ultimately prevails. I am convinced that as these things are discussed, that we're going to come out about where we have come out in the past." Specifically, Keene said he expects people will agree that those who misuse guns should be prosecuted and that "guns should not be kept out of the hands of law-abiding American citizens." Keene's remarks echo those of NRA CEO Wayne LaPierre, who argued Wednesday before the Senate Judiciary Committee that the only change that needs to happen is the Obama administration doing a better job of enforcing current gun laws. There have been discussions about gun control "at various decibel levels over the last several decades, and it's always come out that way," Keene said of the focus staying on enforcement of current laws. "I expect that's going to happen again." Asked again if he thought anything was different about the current debate, particularly given that President Barack Obama has made gun violence a priority issue and lawmakers in both parties are publicly supporting measures targeting gun violence, Keene replied, "No." Several gun-related bills have emerged on Capitol Hill in recent weeks, most notably legislation to ban assault weapons and high-capacity gun magazines. Those bills aren't likely to move, but all eyes will be on Sen. Charles Schumer (D-N.Y.) when he unveils what is expected to be bipartisan legislation calling for universal background checks, one of the few proposals that stands a chance of passing Congress. Currently, background checks aren't required at gun shows or for private gun sellers, who account for as many as 22 percent of gun sales. The NRA has already signaled it won't support any changes to the national background check system, despite recent polls showing as many as 91 percent of people backing universal background checks and despite LaPierre calling the current system a "failure" in Tuesday's hearing. Keene said Thursday that the problem with universal background checks is they would be too difficult to enforce. He cited instances of family members selling each other guns and wondered aloud how that would work. He also said Michigan does it own universal background checks and "they're widely ignored." Curiously, Keene also said the current national background check system is "not much of a burden" and said it's a good thing because it provides an opportunity to check for "spousal abusers" when they seek out guns. He also conceded that, in some instances, it would be "relatively easy" to expand background checks to more buyers. Nonetheless, he brushed off the idea that he was giving mixed messages about the NRA's position on the matter. "They've done surveys of where criminals get guns, and very few, less than one percent, get them at gun shows," Keene said. "We can argue about concepts, but I'm saying, what's the benefit from that?"